As I scrolled through Twitter on my break from work on Wednesday afternoon, reflecting on what was a hard-fought but largely deserved victory for City the previous night, that resonant yellow and green icon caught my eye on the left-hand side of the screen. As anticipated, it was a tweet from Norwich City. The club’s presence on social media has improved markedly over the last few seasons, moving on with the times and adopting an increasingly modern, visible and youthful form. Indeed, this tweet – despite its notably divisive nature judging by the range of comments received – represented a clear continuation of this trend. Funnily enough, I featured in the tweet. 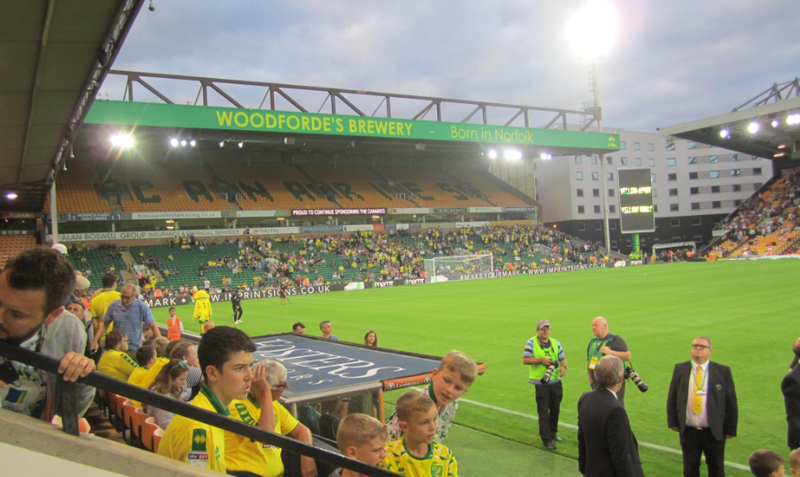 The post was a picture showing fans in Tuesday night’s inaugural ‘singing section’, a scheme laudably set up by the creative groups Along Come Norwich and Barclay End Norwich in order to foster a more raucous atmosphere in a Carrow Road that has regrettably become more subdued since our three-year stay in the Championship began. It wasn’t the best quality image – many in the picture weren’t actually singing and my face was obscured by a large yellow flag – but the sentiment was sound. Throughout the 90 minutes on Tuesday evening, the few hundred of us congregated in Block E of the Lower Barclay made relentless noise, roaring on a weakened City side that visibly struggled against well-organised fourth tier opponents. I don’t normally sit in the Barclay – my home for the last twelve seasons has been in the more reserved quarters of the South Stand with my dad and brother – so such an experience at home was a unique one for me. While away games provide ample opportunity for more partisan behaviour and expressing support in an overtly audible form, Tuesday night was a Carrow Road first. And it was an unequivocal success. Yes, there were those on social media who appeared ardent about bashing it as a manifestation of the club’s ostensibly ‘tin pot’ status, but the reality is that something different and innovative had to be done to change the atmosphere situation when City play at home. For the whole game, evocative renditions of ‘On the Ball City’, ‘Oh when the Greens…’ and, of course, the new Onel Hernandez chant could be heard from the area, seeking to help Daniel Farke’s men tick and find a breakthrough against Stevenage’s resolute backline. Although it may have taken over 80 minutes, our efforts – assisted by the class of Teemu Pukki, Kenny McClean and Hernandez after they came on – eventually paid off. We can only hope that the advent of the scheme will lay the foundations for a conspicuous improvement in the atmosphere at Carrow Road over the coming months. Granted, it may have only been a Carabao Cup game where many of the Barclay’s regulars would not have been present, but hopefully, Tuesday night will set a precedent for many of this season’s subsequent home games. Contrary to what many believe, atmosphere does matter. Having visited the likes of Huddersfield, Sheffield Wednesday and Leeds over the past two seasons, the atmosphere at all of those grounds – and several others – represented the antithesis of what we have become grimly accustomed to when we play at home. As Along Come Norwich and co shrewdly realised, something really did have to be done. The singing section came three days after the organised fan march from Queen of Iceni to the ground prior to the West Brom game on Saturday afternoon, another marked success that saw the animated scenes present across Riverside get carried into the ground and help produce a more vocal Carrow Road during the first-half in particular. The football we were treated to at times complimented the noise perfectly, proving to us all what we can be capable of when Farke’s side click and the crowd come together and unite as one. Whether or not Tuesday night’s atmosphere revolution will change things on a long-term basis remains to be seen. Indeed, I sense much of the outcome will hinge on how this season pans out, with the notion that the noise generated by fans can be independent of performances on the pitch appearing largely idealistic and unviable in practice. The truth is, it is inherently more difficult to vocally support your team when they are constantly under the cosh. But hopefully, such a scenario will not materialise. As all of us had hoped, the opening two league games have seen City move the ball with more pace, purpose and tempo, with the likes of Pukki, Hernandez and Jordan Rhodes functioning as central to this change. If we play with the same enterprise and dynamism at Bramall Lane on Saturday afternoon, I’m genuinely confident we can get a result. Off the pitch, however, all credit to Along Come Norwich and Barclay End Norwich. They tried something different, thought outside the box and boldly helped facilitate a terrific atmosphere in the newly Woodfordes-sponsored Barclay this week. If Farke’s team continue to develop and attack with a similar sense of rhythm seen this season so far, we can only hope that this welcome improvement will continue. Good to hear (pun not intended) that the atmosphere may be returning to Carrow Road. I took my wife to two games over the last couple of seasons (although one was a friendly and the other an early round cup fixture against lower league opposition) and I was frankly embarrassed by the lack of noise. Atmosphere does make a difference so anything the club can do to improve it welcomed by me. OTBC! I’m a south-stander too, and if we can get this off the ground I’d be tempted to move to a singing section! I’m really pleased to see this initiative and fans should support it, rather than knock it. One thing for anyone out there involved in the flag purchase – Can you get even bigger ones?!!! Not sure if this is possible but this would look really impressive if you could. We need a wall of yellow to make our ex- Dortmund players feel at home! I take my hat off to the groups behind this. It is sad how football grounds have become sterile, I remember moving from the old south stand to the barclay .. the birth of the barclay boys and Lilian Kemp (grand city supporter now must be in her 80’s. She her daughters friends and family became the barclay girls. Being honest nobody organised anything except the away coach travel, songs were quickly thought of for most players, then we coined what other clubs were singing. Believe there was nothing quite like standing in the Kop end at Liverpool when they were in full voice of You’ll Never Walk Alone. Any true blooded football supporter had a lump. it was magical. Not saying the Barclay reached that height, but hell we were good, someone started a song or chant off and within seconds it was sung by all. Yes Hooliganism was rife, but all in all Norwich were not bad fans, yea odd moments. but othing like what we came up against mostly where ever we went. Yes I am looking back fondly to some magical moments at we sung our hearts out at. What happened in introduction of seating, clubs changing it targeted supporters, which we we fondly called the Pawn Salad Brigade. I’m a sedate City Stand-er, and was slightly sceptical about the Singing Section. Well-intentioned, of course, but would it actually work and make a difference? Having witnessed it on Tuesday night, I agree 100% with Will: it was an unequivocal success. Congratulations to all involved, and hope it can be developed further. Up with this sort of thing. The place has been too quiet for too long. The club might well promote it positively, but if they want to get younger, and naturally louder, fans in to make more noise, they really ought to look at those ticket prices. I’m really happy that this singing section has taken off and livened up the atmosphere so effectively. Most City matches I see are away when the visiting City contingent pretty much forms its own singing section and I get to join in; at home I only get casual tickets for the funereal South Stand so need a lively Barclay end to give me someone to sing with. One request: please would those in the singing sections, home and away, come up with more chants for individual players… ?